Individuals in Redlands, CA, have plenty of reasons to search for storage solutions. In some cases, families are storing furniture that will be handed down to their children upon graduation or marriage. In other instances, individuals need a safe and secure location to keep family heirlooms, items that hold special memories, or valuables such as artwork, and decorations. Whether the value of your items is sentimental, practical, or traditional, finding a location to store them is a big decision. You'll want to find a facility that is in a convenient location and is close enough to home that you can access your items or place more items in storage without needing to drive a long distance. You'll also want to make sure that the facility has convenient hours, in case you need to access the storage unit on a weekend or evening. Size will be important too. Perhaps you only have a few items and a big unit would be empty and wasteful. Or maybe you have a lot of items and need more room. However, the most important consideration for a storage unit is how secure your items will be. Indoor self-storage has plenty of benefits. First, it protects your items from changes in temperature that can occur in storage sheds or garages. These changes in temperature may seem benign, however, it can damage artwork or wood materials over time. Secondly, indoor units offer more protection against rodents, insects, or other pests. 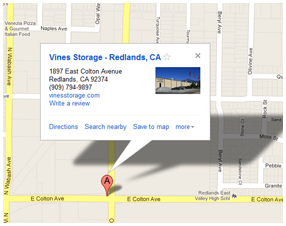 Vines Storage in Redlands has been serving individuals, families, and businesses in the local area for many years. Our location offers the best technology for security with 32 video cameras, a monitored and locked entrance, and on-site staff. From small 5' x 5' units to those that are equivalent to a two-car garage, we offer a range of spaces to suit the needs of our clients. Furthermore, we understand that everyone's leasing needs are different. Some people need to store items indefinitely, while others only need it for a short period of time. We offer flexible leasing options so you're never pressured into a contract for more time than you need. For more information about how Vines Storage can help you with your storage needs, call or stop by today. Our professional and courteous team is ready to help you.